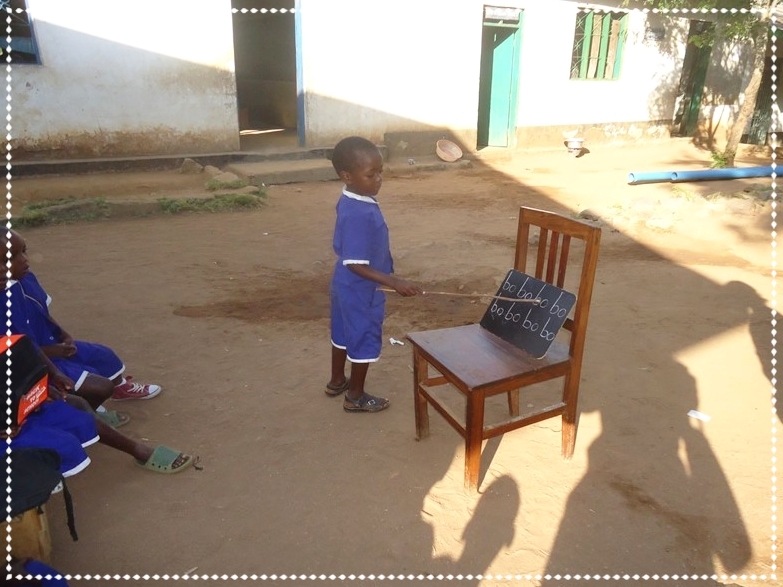 FkW’s Theory of Change recognizes that sustainable, quality pre-primary education (PPE) requires support to classroom and teaching processes as well as advocacy, planning and management of pre-primary education at local levels, including the district, ward, village, and school. The FkW initiative aims to establish an enabling environment so that local government and school management structures support schools to provide quality pre-primary education. Key education stakeholders include: District and Ward Officials; School Management Committees; and local community members. The FkW local education partners have worked with School Management Committees (SMC) representatives and District and Ward Education Officials to discuss topics including the importance of pre-primary education; child development and brain development; school readiness; and learning processes focusing on play. The FkW team has also worked with stakeholders to help them identify and implement their respective roles and responsibilities in providing quality pre-primary education. The purpose of the qualitative portion of the study is to document and track stakeholders’ perceptions and ideas about the broad study questions, such as which are the most salient aspects of the FkW model, what improvements are still needed in model components, and what new or persisting challenges undermine the quality of pre-primary education. We are investigating and documenting the strategies that teachers, schools, communities, and districts are implementing to improve the quality of pre-primary and how to make those strategies both scalable and sustainable. We also plan to explore the stakeholders’ views and recommendations on the policy, programmatic, and systemic improvements and adjustments needed to help schools and teachers continuously improve quality and overcome the contextual challenges across Tanzania. Finally, we will explore how successful practices and activities can be scaled and sustained in a cost effective manner country-wide. We plan to conduct qualitative interviews with key informants including teachers, both certified and paraprofessionals; head teachers; and the District Academic Office, District Executive Director, Ward Education Officers, Village Education Officers, and Quality Assurance Officers. We will also interview representatives from the Ministry of Education and Vocational Training, the President’s Office of Regional and Local Government, and teacher training colleges and Training Resource Centres. Further, we will conduct focus group discussions (FGDs) with parents, community members, and School Management Committees (SMCs). We are conducting qualitative interviews and FGDs to track changes in opinions, achievements, and challenges over time. In most cases, we will contact the same informants to best track the evolution of processes, implementation, and perceptions. The teacher interviews will focus on open-ended questions in which informants can articulate their perceptions of teacher training and mentoring, instructional methods, implementing the FkW approach and TIE curriculum, the school and classroom learning environment, use of learning materials, classroom management, student learning, enrollment and attendance, school leadership and support, parent partnerships, and community supports. For early findings from teacher interviews, click here. The interviews with head teachers will focus on perceived changes in teachers’ practices and the learning environment, and explore respondents’ perceptions of leadership activities to support pre-primary education, support from education officers, capitation grants and the use of funds in pre-primary, implementation of school action plans, and teacher preparedness and instructional practices. We will also explore interactions between head teachers and SMCs, WEOs, VEOs, and other local actors, as well as perceptions of the sustainability, scalability, and cost effectiveness of FkW. For early findings from head teacher interviews, click here. The interviews with the District Academic Office and District Executive Director will focus on informants’ perceptions of pre-primary education, contextual challenges and overcrowding in classrooms, and the roles and responsibilities of DAOs and DEDs in supporting education. We will investigate the financing of education in general and pre-primary specifically, as well as other potential sources of funding for pre-primary education. We will also inquire about the interaction between national, regional, and district offices with regard to education policies, the most salient aspects of the FkW model, and the sustainability, scalability, and cost-effectiveness of FkW. This may include, for example, enforcing age-restriction policies to reduce overcrowding, or implementing child care programs targeted to children under age 5 who are not ready for pre-primary classrooms. The interviews with the WEOs and VEOs, and the Quality Assurance Officers will focus on topics related to the oversight and implementation of pre-primary education, including supporting schools, improving the school and classroom learning environment, and efforts and challenges to ensuring quality in pre-primary. We will explore informants perceptions’ of pre-primary education, the FkW approach, TIE curriculum, recent policy changes, teacher preparedness, teacher training, teacher recruitment and retention, and recommendations on how to improve quality in pre-primary classrooms. We will also inquire about informants’ interactions or recommendations for SMCs and parent and community engagement. In interviews with the representatives from the Ministry of Education and Vocational Training, the Tanzania Institute of Education, and the President’s Office of Regional and Local Government, we will ask informants about their perceptions of progress and challenges in policy implementation; short-term and long-term education priorities; the state of pre-primary education; plans for teacher and paraprofessional recruitment, training, and retention; filling the teacher shortage; and costing and financing in education, including capitation grants. During interviews with representatives from the teacher training colleges and Training Resource Centres, we will focus on their perceptions of both pre-service and in-service teacher training and activities related to teacher and paraprofessional recruitment, training, and retention, as well as short-term and long-term strategies designed to alleviate the teacher shortage. We will also investigate informants’ perceptions on the value of the FkW model, including the TTC tutor training and implementation on the part of AKU, CiC, and the local education partners. The focus groups with parents and community members will focus on participants’ perceptions of pre-primary education, FkW, the school management and leadership, teachers’ instructional practices, the school and classroom environment, and overcrowding and safety. We will also ask about parents’ and community members’ perceptions of their successes and challenges in community engagement and contributions, as well as promising approaches to improving schools that might be replicated. Parents will be asked for their perceptions of the value of the Parent Partnership Program (PPP), how they would assess student’s learning, and the role that parents play in ECE. For early findings from head teacher interviews, click here. The FGDs with School Management Committees will focus on participants’ perceptions of pre-primary education, the SMCs’ activities related to pre-primary, SMCs’ supports and challenges, the school and classroom environment, the FkW model, and school financing and additional sources of support for pre-primary. We will also investigate SMC’s perceptions of the teacher shortage, the use of paraprofessionals, enforcing national age guidelines for pre-primary students, and parent and community engagement. For early findings from head teacher interviews, click here.